probably, London, Lefevre Gallery, Lucian Freud, 1944, catalogue not traced. A highly developed faculty for observation, as if faces or bodies were being examined in close up, is a quality associated with all of Freud's work. His work of the 1940s, with its essentially linear and graphic perfection was short-lived, but it was in these formative years that Freud discovered most of the themes that would later preoccupy him, and therefore the early paintings and drawings hold an important key. Early external influences include Netherlandish painting; Freud remembers reproductions of Dürer watercolours from the Albertina (especially The Hare and The Great Piece of Turf) on the walls of his parents' apartment and it could be argued that his own attention to the detail of the natural world owes something to Dürer's example. The young artist's choice of subject matter was often also inspired by the natural world and Freud identified with animals from an early age. 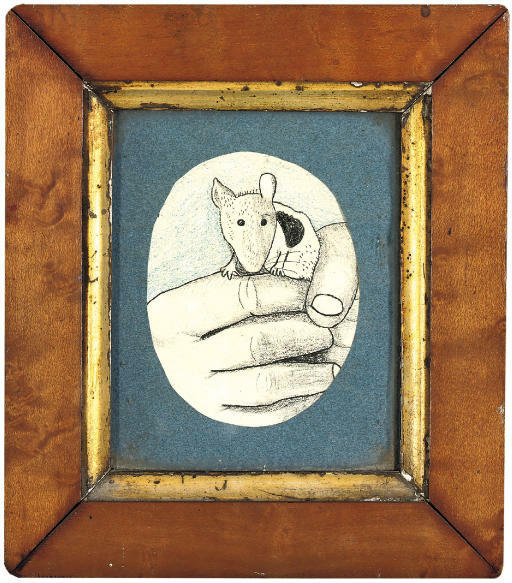 The portrayal of humans in close proximity with domestic animals is a favourite theme and in Pet Mouse one can see an incredible perceptiveness and sensitivity. The scale of the drawing serves to further emphasise the detail and highlights the dynamics of bringing man and animal together giving equal amounts of character and individuality to each. The mouse is a pet, but also a wild animal, and the hand that holds it is both firm and gentle. A direct comparison can be drawn with Boy with a pigeon, 1944 (private collection).